Gangways, generally, are placed over a foundation of concrete, where anchor bolts are embedded. A typical configuration has two plates joined with the anchor bolts. One plate, the lower one, is embedded in the concrete and the other, the upper one, is in the upper limit of the foundation, just below the gangway flange. 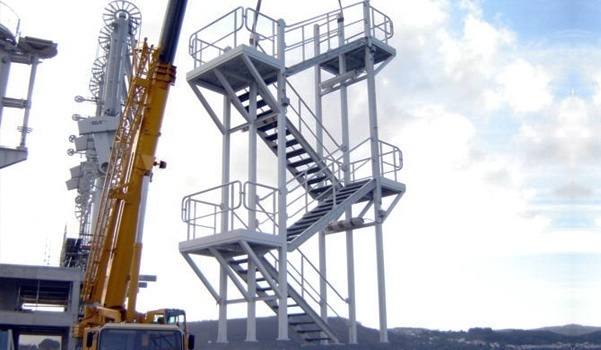 For accessing from the jetty to the fixed platform located on the column, it has hot dip galvanized steps grid. It will be attached to docking by anchor bolts. 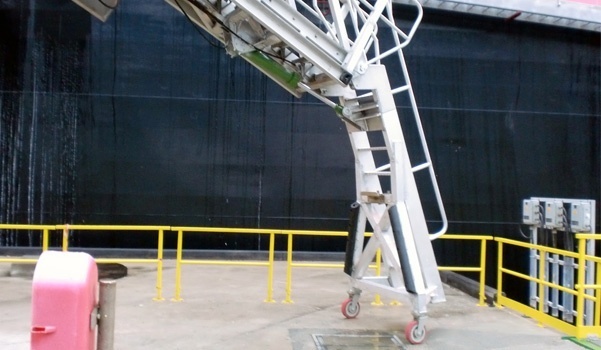 The rotation mechanism of the gangway is formed by a shaft on which is located the slewing platform that gives access to the telescopic ladder. 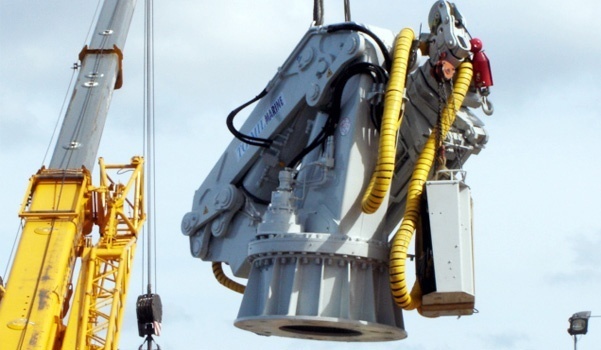 It relies on a roller bearing and on an axial ball bearing that absorb both axial loads and radial compression. These bearings are housed in a bed endured by the column cantilever. The slewing shaft is guided on a two halves bronze spherical sliding bearing joined to the column. 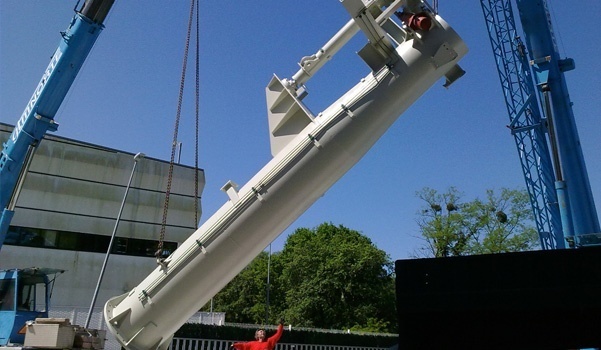 The lower support of the lifting cylinder of the telescopic ladder is located on the slewing shaft. The slewing platform is made one piece with the slewing shaft by bolting it to the same. 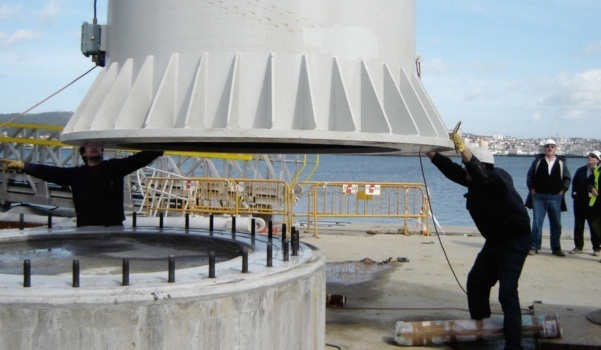 The slewing cylinder is placed below the platform. Its crankpin is bolted to the turn platform. The telescopic ladder is fixed to the platform. Its front part has the point of union of the luffing ladder. Comprises in two aluminum lattice structures, one external fixed to the slewing platform and one internal sliding on the fixed. The fixed scale is attached at one end to the slewing platform and on its underside engages the pin of the lifting cylinder. 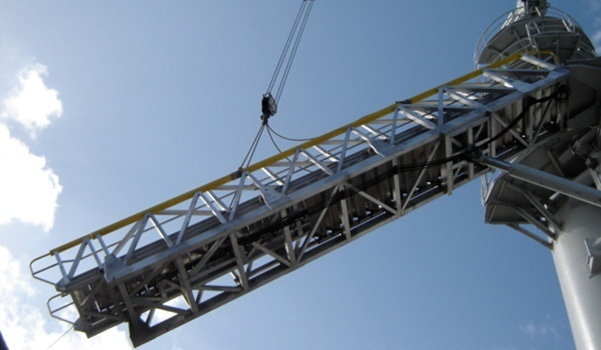 Both the steps of the outer scale as those of the inside section are self-ajustable, that are always horizontal, regardless of the lifting angle of the telescopic ladder. 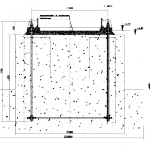 The bulwark ladder is coupled at the end of the telescopic ladder. It’s an aluminum tubular structure, with a tripod form that incorporates an access ladder that can be with fixed steps or rotary steps with a 180 degree turn. It relies on the deck of the ship over the plastic wheels that can rotate 360 degrees on their vertical axis or counterbalanced so that the bulwark always stays vertical. 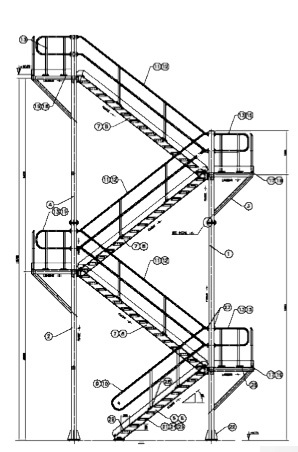 In the case of rotatory stairs, it incorporates a hydraulic mechanism allowing it to rotate up to 180 degrees. An option exists with 2 points for support. It includes a closed circuit of 2 cylinders to ensure the verticality and stiffness and specific adaptations to each one.